Do I love Pottery Barn? Yes. 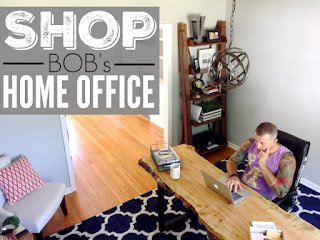 Do I love an awesome Pottery Barn knockoff? H*ll yeah! 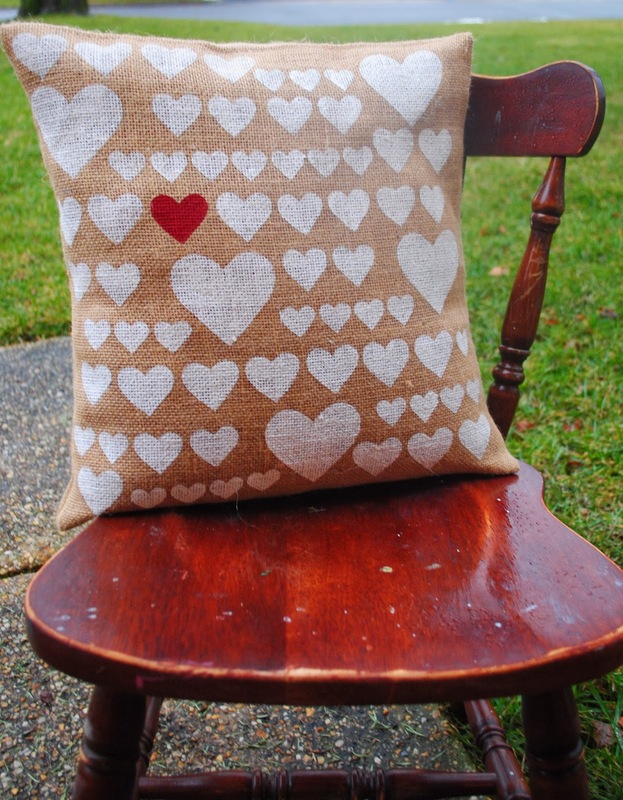 And so I present to you...my PB-inspired burlap heart pillow. 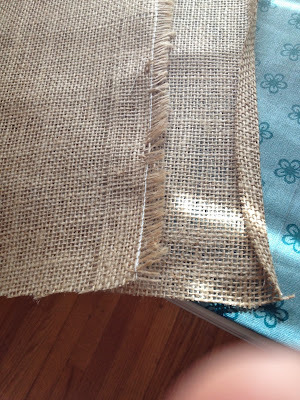 The original version is not burlap and it's not square...but guess what...that's what makes it awesome to DIY, you can make it EXACTLY how you want it. So if you have a 16x16 pillow form at home, you can make a 16x16 envelope-style pillow cover and then you don't have to buy a lumbar pillow form because Pottery Barn's heart cover only comes in the 12x24 lumbar size. As I mentioned, I made my pillow cover using burlap, but if you like the look of the original versions' linen fabric, you could also use a drop cloth for your cover. I've done many a drop cloth projects they always turn out beautifully. Whatever fabric you decide to use, the process is the same so let's get started making the envelope pillow cover - then we'll talk about adding the hearts. I'm going to be referring to a 16x16 size burlap cover throughout. 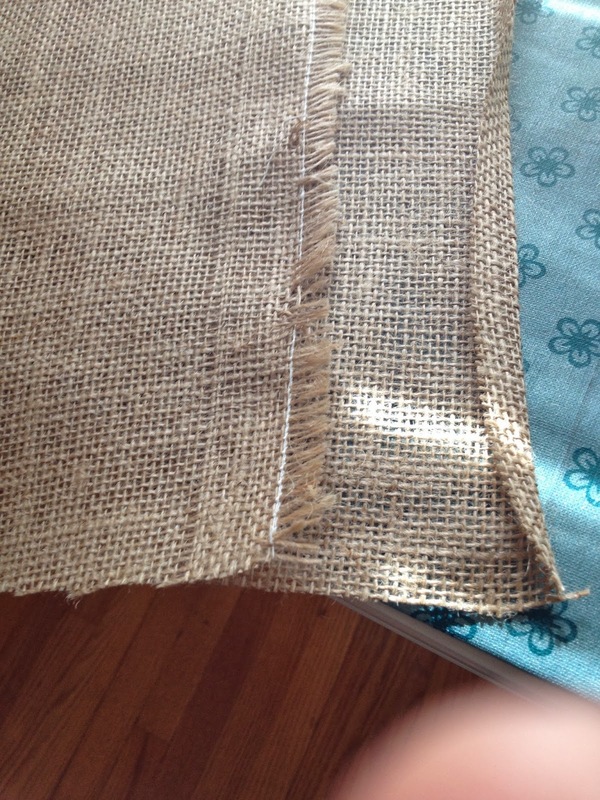 First, you need to cut the burlap into one large piece. To make a 16" wide pillow I always cut the piece 17.5" wide. The extra 1.5" is to account for the side seams. Once you sew the sides together the pillow cover will be 16" wide. 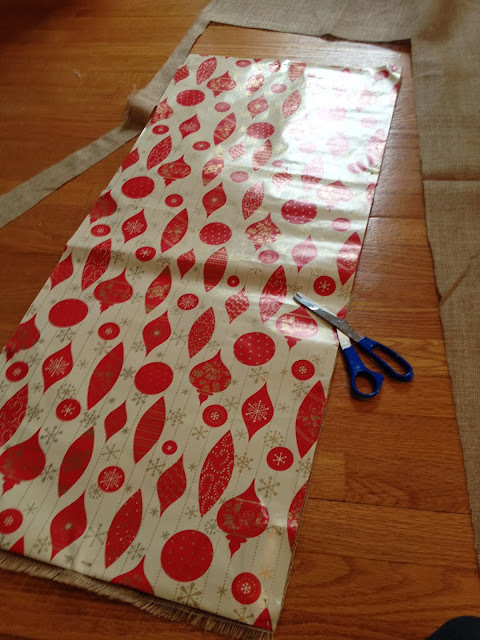 You can make a pattern 17.5" wide by 38" long out of wrapping paper and use it to cut out your burlap or you can just use a measuring tape and no pattern, but if you do it this way, but sure you're following my guide on cutting burlap straight. Iron the piece of burlap. Use a zig zag stitch and sew along the very edge of the two long sides. This prevents the burlap from unraveling. Double fold over and press each of the shorter ends to create a hem before sewing a straight stitch all the way across. Now fold the two ends up and over each other toward the center. 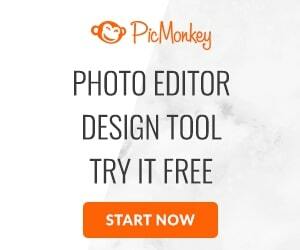 You want to make sure the square that you've just created is 16 inches. You also want to make sure the wrong side of the hem is up. Iron where the two folds are so you create a 16" box in the middle. Don't get all jumpy and start sewing yet...first it's time for the fun part - the stencil. You can use a plastic heart stencil if you have one or make one yourself. I used my Silhouette to make an 8x11 stencil with various size hearts and cut it on freezer paper. If you do not have a paper cutting machine, you can trace the hearts and then cut them out using an exacto knife. However you do it, I highly suggest making your stencil using freezer paper. 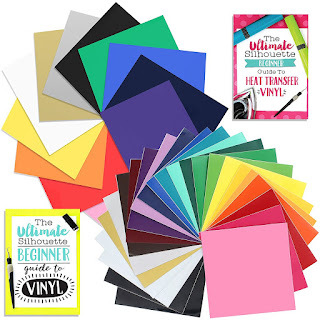 I give my my argument for DIY freezer paper stencils and a quick tutorial on making one (on our newly launched sister site) Silhouette School. I'm going to assume you created a stencil with freezer paper from here on out. Now grab your burlap pillow cover again. We are only going to work with the center square, but start by unfolding the entire piece (you do not want paint bleeding through onto the two ends so keep them out of the way). Starting at the top near the crease line - and preferably at the corner - place your stencil with the shiny side down and use a hot iron to adhere it to the burlap. Make sure there are no spots where the stencil isn't tight on the burlap. Now you're going to use foam pouncers - I love Martha Stewart's pouncers - to blot the paint on in an up and down motion. Do no brush back and forth. While the freezer paper does a wonderful job of preventing bleeds, brushing back and forth can move the stencil and cause paint to go under the stencil. After I'm done painting, I remove my stencil right away by simply peeling the freezer paper up. You can leave it until the paint dries, if you prefer. The only drawback to freezer paper stencils is they can't be reused. To add more hearts you'll need to create another stencil. I had my Silhouette cut another stencil and once the first set dried, I ended up cutting sections of hearts apart and ironing them on the burlap until my entire front panel was filled with painted hearts. When all the paint is dry and you're ready to sew up the sides, lay your burlap piece out with the hearts facing up. Fold the two ends over the hearts section so they are overlapping each other. Sew up the edges and then flip the pillow cover right side out. I just adore how this painted pillow cover turned out. 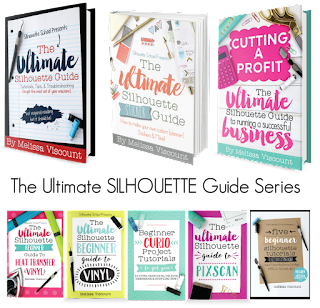 Having made many stencils and even printed directly onto burlap, it's amazing how easy the Silhouette machine makes a project like this that otherwise would be fairly labor intensive. 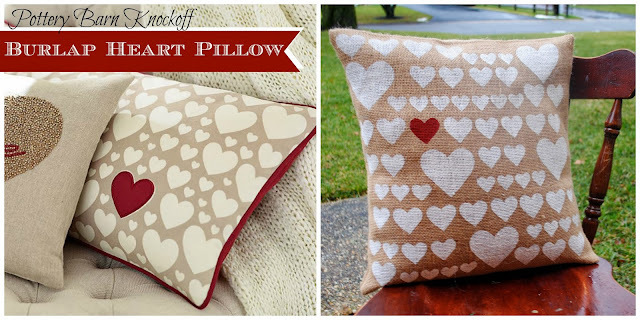 If you love this painted burlap heart pillow, but would rather us "two" the work for you, we have produced a limited number for sale in our Etsy shop, Cuteness Cubed.